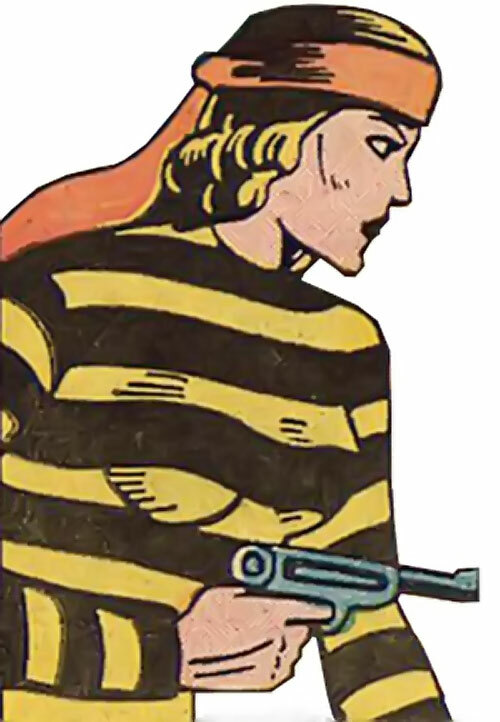 The Tigress is an early Golden Age DC Comics character, who appeared from 1938 to 1941. Though she’s obscure, she’s had a surprising legacy across the ages. Tigress (Zatara enemy) – this here writeup. Tigress (Paula Brooks profile #1). Huntress (Paula Brooks profile #2). Artemis (Artemis Crock profile #1). Huntress (Artemis Crock profile #2). As usual back then there were but the barest bones of characterisation or continuity. The characters were amorphous and mutable, which is always a difficulty for Golden Age profiles. Thus, this profile has to pick, chose and emphasis to offer a coherent portrayal. Real Name: Unrevealed, though her last name might have been Brooks. Known Relatives: Paula Brooks (aka Tigress, aka Huntress, daughter), “Crusher” Crock (aka the Sportsmaster, son-in-law), Artemis Crock (aka Tigress, aka Artemis, grand-daughter). Group Affiliation: Leader of her own criminal crews. Height: 5’6” Weight: 125 lbs.. The Tigress is smart and observant. She also has good reflexes and numerous underworld contacts. She plotted many clever crimes, and escaped from the law time and again. She’s a good driver and pilot. Beautiful and socially talented, the Tigress finds it easy to manipulate most men. Thus, she often recruits gunmen to be the muscle of her operations. She occasionally dated criminals with minor paranormal powers. The Tigress is also a competent international adventurer/explorer type. But admittedly, such endeavours are greatly facilitated since in these stories’ genre almost everybody on the planet speaks English. Here is a summary about the publication history of these characters, since it can be a mite confusing. 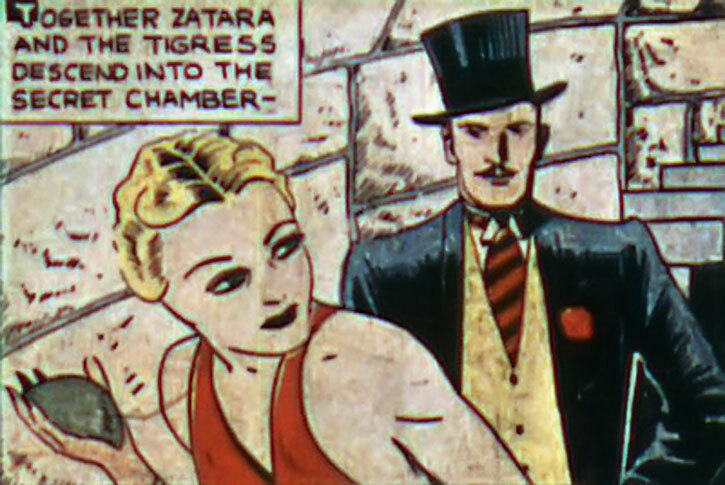 The Tigress was Zatara’s most recurrent antagonist. 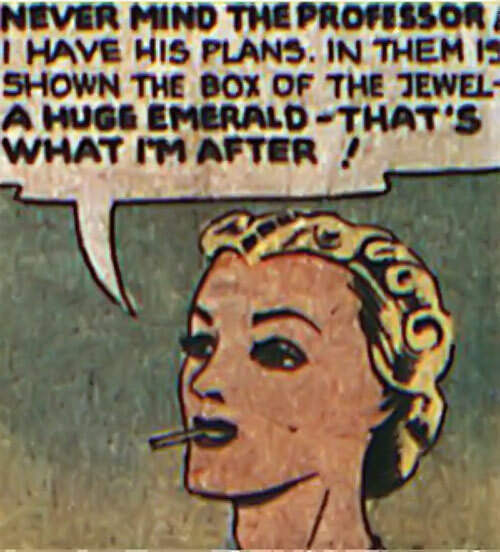 She first appeared in Action Comics #1 in 1938. She was a stock character and would have finished deep in comics limbo . However, secondary sources revealed that she was Paula Books’s mother. This profile is about her. This link is established but once — on the Artemis page in the 1987 Who’s Who in the DC universe update. It is no longer present in the Who’s Who update released on the next year. This has occasionally been interpreted as a change of mind on Roy Thomas’s part. But Mr. Thomas confirmed for us that wasn’t the case. It was another person at DC who thought of Zatara’s foe. The Huntress (Paula Brooks) is one of the scant memorable Wildcat (Ted Grant) villains. She appeared in 1947, and clashed with Wildcat a half-dozen times in short succession. Then she vanished for almost 20 years before making a few comebacks on both Earth-1 and Earth-2. Yes, both Earth-1 and Earth-2. We’ll cover that in her profile. 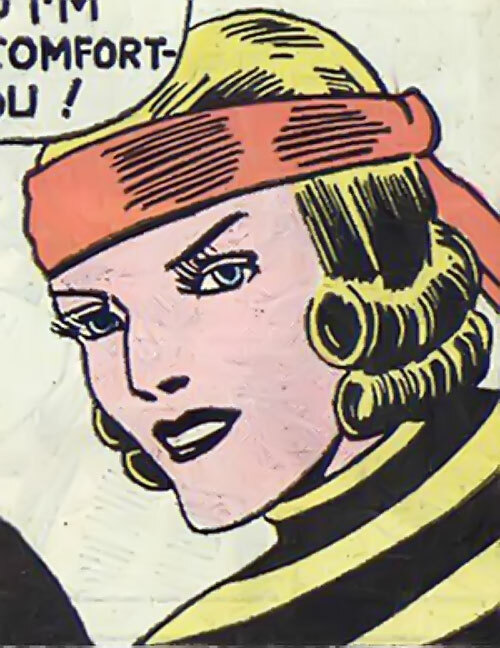 The Tigress (Paula Brooks) appears in comic books published in 1987 and joins the Young All-Stars in stories set in 1942. She was created by Roy & Dann Thomas. 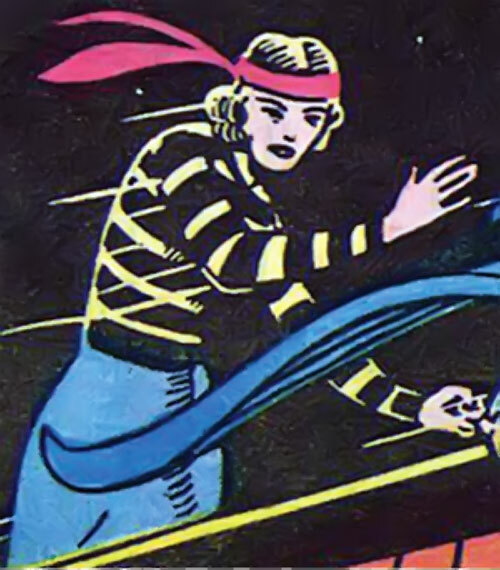 She was a possible younger version of the Huntress, who perhaps would turn evil before 1947 to become Wildcat’s enemy. It is also in 1987 that Dann & Roy Thomas introduce Paula Brooks’s daughter Artemis. They reveal her parentage as she busts her parents out of prison. In 2000, Artemis changed her code name to Tigress. She also changed her modus operandi to become a bit more like her mother’s. Our profiles assume that the original Tigress was the mother of Paula Brooks. They also assume that Paula Brooks aka the Tigress later became the second Huntress. As you can see these assumptions are not proven, but the product of strong implications and not-quite consistent secondary sources. The date of birth of the original Tigress is unrevealed. 1908 or 1909 would be our best guess. 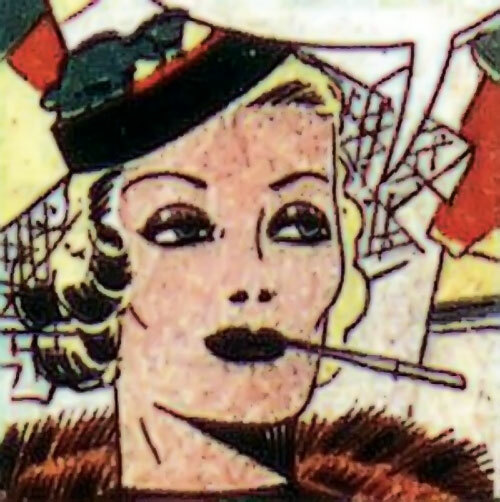 By the late 1930s, she was a famous criminal. 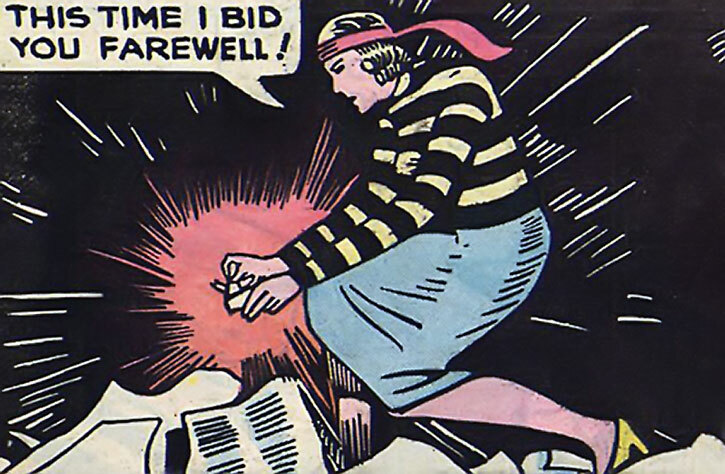 The Tigress had apparently earned her nickname based on her initiative, her courage – and the distinctive yellow and black striped sweater she occasionally wore. The Tigress often clashed with the magician Zatara and his henchman Tong. He defeated her time and again but she always escaped. The Tigress’s activities included such 1930s classics as train heists or tricking plucky orphans out of vast inheritances. She also ran schemes such as seducing rich men to be in their will, then having war planes machine-gun them from the air on Main Street (!). Like Zatara the Tigress was an international adventurer. 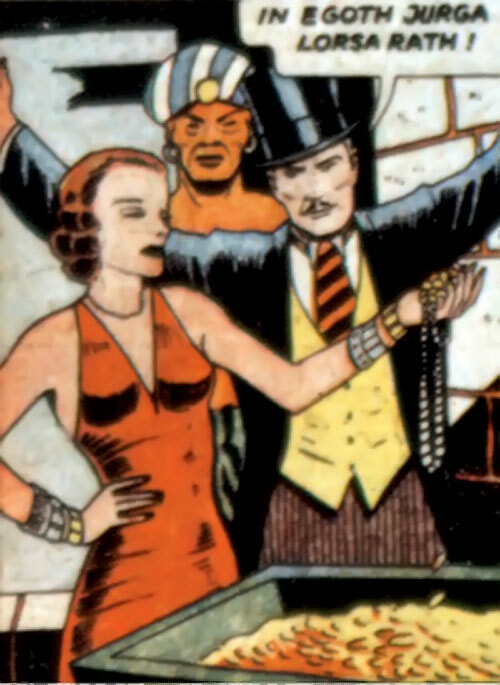 Unlike Zatara she sought to steal riches abroad (preferably large gemstones and ancient treasures) or ally with men of power (such as evil Tibetan lamas with hypnotic powers almost matching Zatara’s, or magicians from South America). Though she was Zatara’s enemy, they allied quite often during their foreign adventures. They even once shared the huge treasure trove of Genghis Khan. Though he occasionally managed to capture the Tigress, Zatara had little interest in sending her to prison. He even once let her go if she promised to leave the country. That was despite knowing that she almost never honoured her promises. 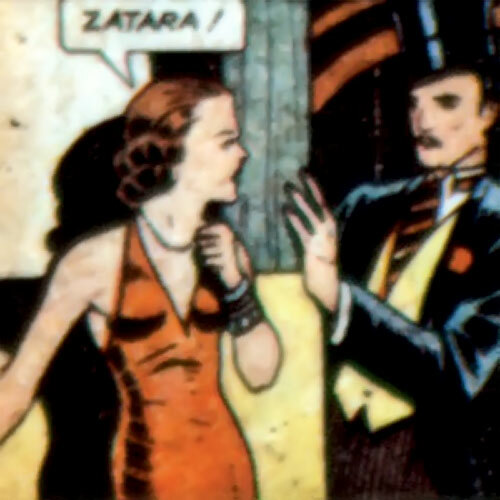 Zatara had the Tigress sent to the big house but once, in 1940. After that he always let her escape, as he couldn’t bear seeing her locked up. Decades later, Earth-2 ceased to exist and New Earth was created. 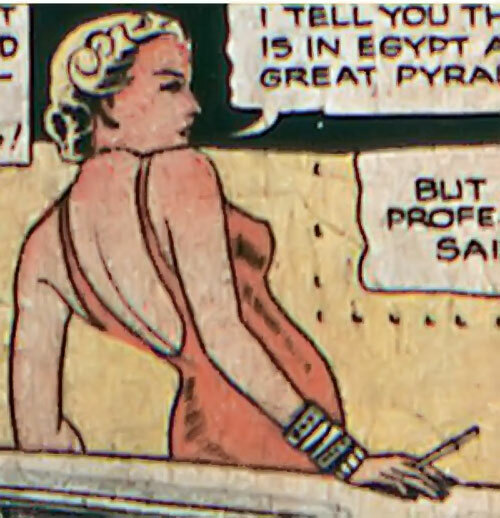 As far as can be determined, the Tigress also existed during the 1930s of this New Earth and had similar clashes with Giovanni Zatara. 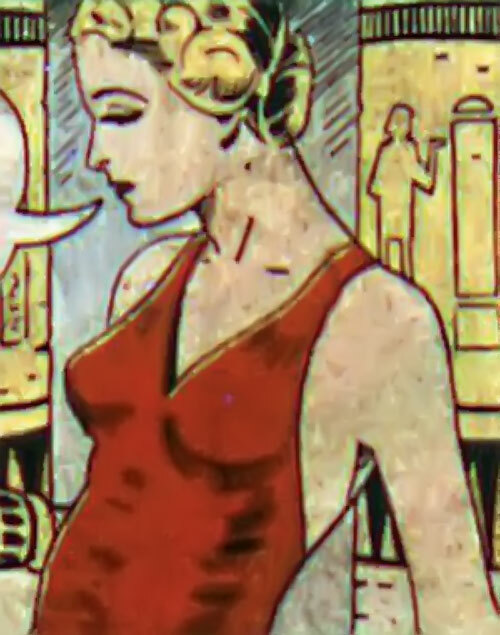 On New Earth, the Tigress had a daughter, Paula Brooks, during the mid-1920s. While still a teenager Brooks would also use the Tigress nickname, but for very different reasons. She sought to associate with the costumed mystery man Manhunter, whom she had deduced was the big game hunter Paul Kirk. Brooks would become known as both the Tigress and the Huntress. See her profiles for more. The original Tigress is assumed to have long since died. 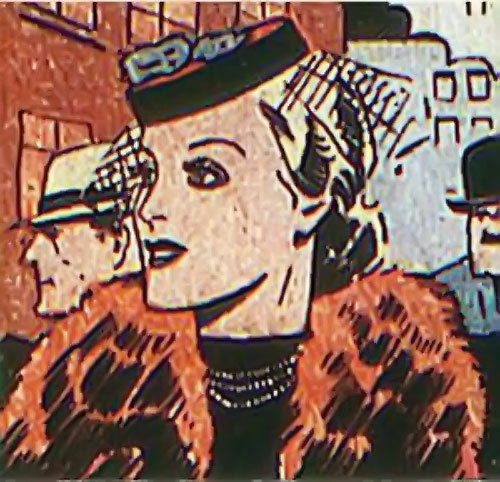 She might have died in the mid-1940s, since in 1947 her daughter demonstrated access to vast resources including real estate, wealth, criminal contacts, etc. she likely inherited from her mother. 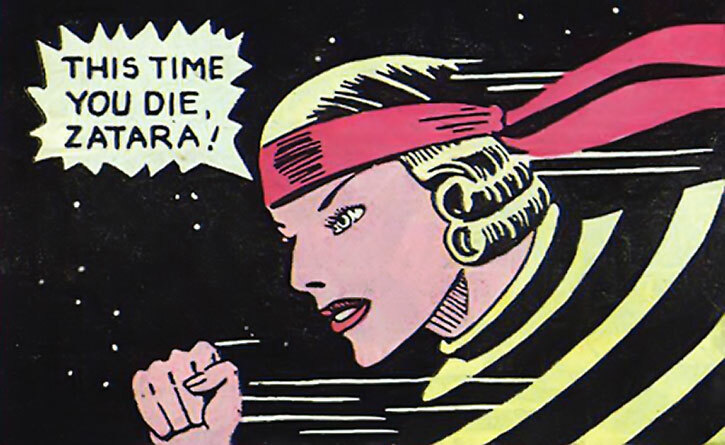 In her first appearance, the Tigress wore her nickname-inspiring sweater and a red headband. Most of the time, though, she dressed like a fashionable upper-class American woman of her time. The Tigress was reputedly evil and malicious. However, she seems to be closer to a ruthless adventuress who doesn’t hesitate to kill people for profit or because they stand in her way. “Amoral” and “pragmatic” would thus probably be better descriptors. For instance, she wouldn’t hesitate to try to kill Zatara if he opposed her. Yet she would gladly ally with him if their interests converged. Despite plotting to get rid of him, she would be a reliable ally as long as it was to her benefit. In such circumstance she seemed to genuinely enjoy his company. The Tigress eventually decided that she didn’t want to kill Zatara after all. That was because he almost always let her escape after thwarting her schemes. Lüger P08 pistol [BODY 03, Projectile weapons: 04, Ammo: 08, R#02]. Holdout .32 ACP pistol [BODY 02, Projectile weapon (Diminishing): 03, Ammo: 05, Miniaturisation: 01, R#03]. A subcompact semi-automatic firing a round that was standard back then – but is anaemic by modern standards. She will carry this if she cannot conveniently carry a full-size firearm. The Tigress also owns various high-powered cars and planes. Close attack 2, Defensive Roll 2, Improved Aim, Improved Initiative, Ranged Attack 3. Attractive 2, Beginner’s Luck, Benefit 2 (Wealthy), Connected, Contacts, Equipment 4, Luck. Athletics 1 (+1), Deception 7 (+8), Expertise (International criminal) 6 (+9), Expertise (Riding animals) 2 (+5), Insight 4 (+6), Perception 6 (+8), Persuasion 2 (+4), Ranged combat (Firearms) 1 (+5), Stealth 8 (+9), Vehicles 5 (+7). Lüger P08 pistol (Light pistol) and/or a holdout .32 ACP pistol (Ranged Damage 1, Feature 1 (Tiny)). The rest of her Equipment pool will be mission-specific gear if needed. She often fields high-powered period cars and planes. Power and riches, mmrrrr The Tigress is always plotting to increase her wealth, power and influence. Points total 74. Abilities 22, Defences 10, Skills 21, Powers 0, Devices 0, Advantages 21. Equiv. PL 5. 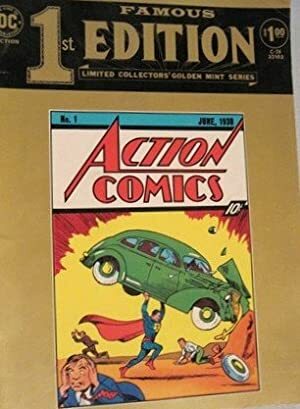 Source of Character: Action Comics during the 1940s (pre-Crisis Earth-2 in the DC Universe). Helper(s): Mike’s DC Indexes, Darci, Mr. Roy Thomas. Writeup completed on the 19th of June, 2011.